Egan Davis, chief educator at the University of British Columbia’s horticulture training program, told CBC news that a green lawn isn’t all it’s cracked up to be. A not-so-perfectly manicured lawn isn’t just easier; it’s more eco-friendly too, since it takes less water and fewer chemicals to keep it looking nice. Davis says it’s fine if your lawn is a little yellow or has a few weeds. To prove his point, we decided to round up a few unconventional landscaping ideas that will give you serious yard envy. Opt for garden beds with some colour instead of a huge patch of green grass. 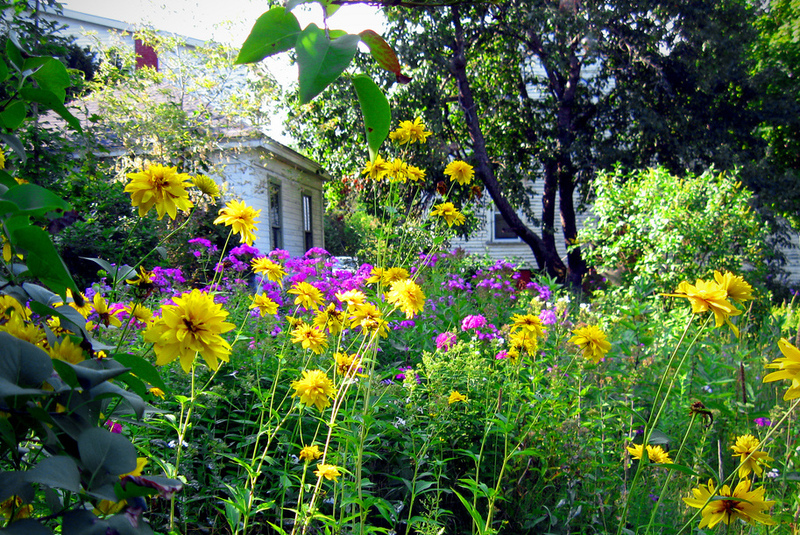 If you select plants native to your area, they’ll do well without a whole lot of upkeep. Better yet, go with wildflowers. You know what doesn’t have to be mowed? Rocks. Use natural elements like rocks, pavers or wood and larger plants to fill in the space. You can still have small areas of grass if you want, but this will help eliminate some of the work. Garden beds don’t have to be perfectly manicured and tidy. Add some small beds to your yard, and let the plants take over. OK, so this is still a lot of grass, but it doesn’t actually count as a lawn when it is really a soccer field, right? Your kids will love this, and you won’t have to worry about them trampling all over it, because that’s what it’s for, of course. Don’t you just want to walk along this little path all day? Skip the lawn completely, and fill the space with flowers and paths for walking. Oh to have this in my yard…"@hgtv: Steal away for a moment of inspiration –> http://t.co/nmbh5v86rX pic.twitter.com/2G6OAF1wcT"
You don’t need a pool to have a nice place to lounge around and enjoy an afternoon cocktail. Create a small deck in the middle of your yard, and you are set. Use your front yard space to create an epic vegetable garden. It may not be any less work or water than an actual lawn, but you’ll get to enjoy the fruits of your labour — literally. Your home might not be an adorable little cottage, but your yard can look just as cute without a bit of grass. Plant bulbs and wildflowers instead. The bulbs will come back each year, and the wildflowers should reseed themselves. Putting green, that is. You might not need the maintenance if it means you can practice your stroke. Instead of spending all your time keeping your grass manicured, you could create a serene setting like this one and spend your weekends relaxing instead.